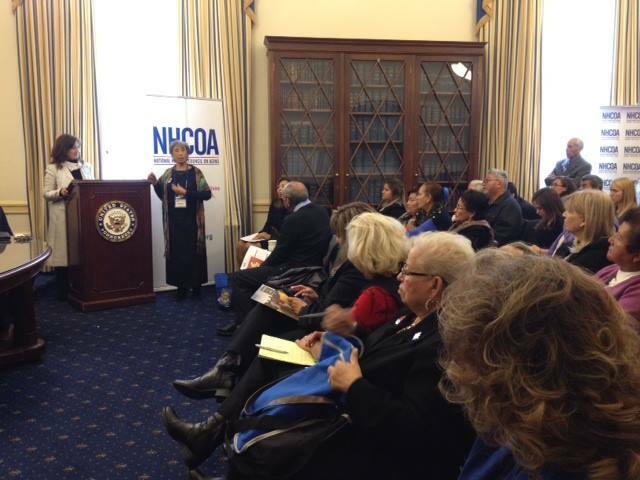 HIP representatives at NHCOA’s Advocacy Day in Washington DC in November 2014. The need for organized efforts to increase culturally competent services for our Latino elders was the focus of the recent “Improving Senior Services Through Effective Advocacy” webinar, which was presented by Hispanics in Philanthropy. 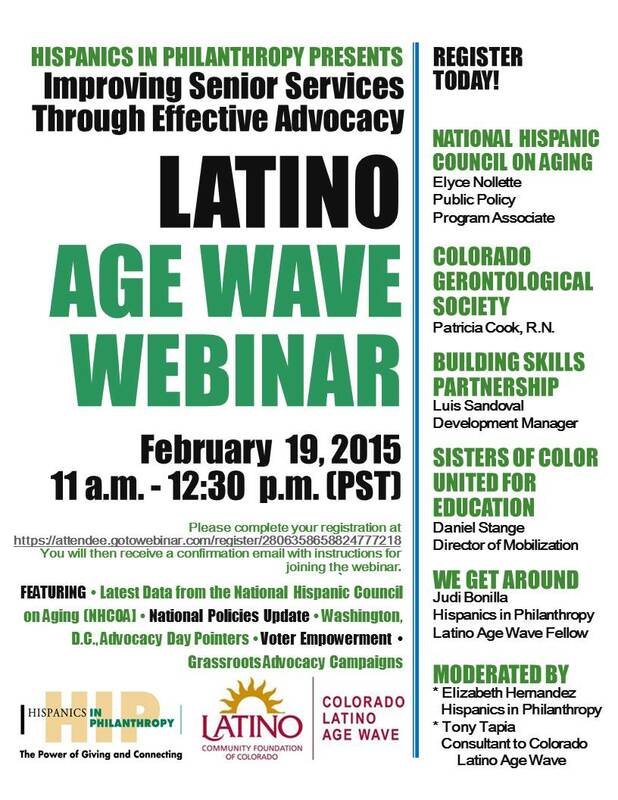 The panelists for the webinar on Feb. 19, 2015 discussed the latest data collected by the National Hispanic Council on Aging (NHCOA); the experiences of participants in NHCOA’s National Advocacy Day last November; the need for political empowerment through voter registration and participation, and the experiences of advocates in the Colorado Gerontological Society and the grassroots Sisters of Color United for Education. Webinar panelists included: HIP California Age Wave Fellow Judi Bonilla, NHCOA Public Policy Associate Elyce Nollette, and representatives from three HIP Latino Age Wave organizations: Patricia L. Cook, R.N., of the Colorado Gerontological Society; Building Skills Partnership Development Manager Luis Sandoval, and Daniel Stange, Director of Mobilization for Sisters of Color United for Education. In her presentation, Elyce Nollette said that NHCOA’s 2014 Status Report on Older Adults showed some of the effects the increasing older Latino population will have in areas such as housing, food insecurity and health disparities. Although a disproportionately high number of Latinos do not qualify for Medicare, the median income of non-Hispanic Medicare recipients is expected to increase to $32,800 in 15 years, while the median income for Hispanic Medicare recipients will lag at $18,100, further behind than it did in 2012. Ms. Nollette also mentioned regional meetings being held this year in the run-up for the White House Conference on Aging, which will focus, among other topics, on ensuring retirement security; issues affecting long-term services; promoting healthy aging, and the need to protect older Americans from abuse, neglect and financial exploitation. Judi Bonilla attended the NHCOA Advocacy Day activities in Washington, D.C., with fellow panelist Luis Sandoval and Maria Becerra, senior programs coordinator at Centro CHA in Long Beach, California. Ms. Bonilla and Mr. Sandoval, who was accompanied by his parents in the Capitol, discussed briefings with three members of Congress and other meetings they had attended. Ms. Bonilla stressed the need for Latinos to seek greater political empowerment, which was urged by U.S. Rep. Lucille Roybal-Allard and others with whom they met. They also were encouraged by the congressional representatives to press the case for renewal of the Older Americans Act, which is set to expire this year. In discussing grassroots advocacy, Daniel Stange pointed out that issues of advocacy around violence and abuse against seniors can be particularly delicate, because older people who have been mistreated may wind up depressed and isolated from losing contact with the abusive family member. “We want to look at counseling and educating the family caregivers,” he added. Mr. Stange’s agency has been successful in adapting a Latino health promotores model that uses a holistic approach in determining what other seniors believe their needs to be. Sisters of Color United also has a Comadres program whose participants advocate the use of mental health services and leadership building, among other programs. The Hispanics in Philanthropy webinar resulted from a collaboration between its Colorado Latino Age Wave and the California Latino Age Wave initiatives, which are funded by the Atlantic Philanthropies, the Latino Community Foundation of Colorado, the Rose Community Foundation, The California Wellness Foundation and The SCAN Foundation.